Founded in 1997 Rapid Production Tooling has grown into one of the largest and most successful manufacturers of plastic injection tooling in Colorado. With a staff of more than 35 employees, Rapid serves customers throughout the US and Mexico with emphasis on Fortune 1000 Medical OEMs and the contract manufacturers who also support them. Rapid has invested heavily in new equipment and technologies to provide state-of-the-art capabilities required in today’s ultra-competitive tooling market. Our ability to run “lights out/24 hours/7 days a week” with our robotics and automation ensures on-time and industry-leading Rapid deliveries to our customers. We sample and run almost every tool we manufacture making sure when the product arrives at the customer it’s production-ready. 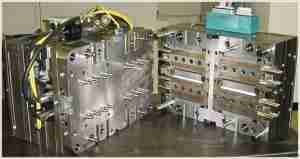 Please contact us for any injection tooling needs. We invite you to schedule a tour of our facility to learn more about Rapid and the world of manufacturing.